Saudi Arabia possesses valuable resources other than oil and gas. As early as 1000 BC, gold, silver and copper were being extracted from the famous Mahd Al-Dhahab mine some 180 miles northeast of Jeddah. The introduction of modern mining and extraction methods has once again made the mine a major producer of precious metals. Exploration projects over the past two decades have unearthed extensive deposits of precious and industrial minerals throughout the country. These include not only gold and silver, but also copper, tin, tungsten, nickel, chrome, zinc, lead, phosphates, iron ore, bauxite, potassium ore and even table salt. 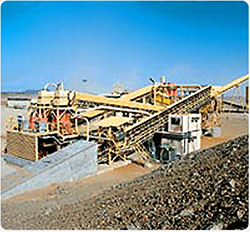 The Kingdom is also probing the mineral-rich sediments on the Red Sea floor for commercial exploitation, with plans to process them at the Yanbu industrial complex. The Saudi mining company, Maaden, has embarked on a project to mine phosphate in the north and process it at a fertilizer plant near Jubail. This project is scheduled for completion in 2008. Meanwhile, Maaden is in the process of privatizing its activities, beginning with its gold-mining operation. The Ministry of Petroleum and Mineral Resources has identified 1,270 sources of precious stones and 1,170 sources of other minerals, and issues an increasing number of mining and exploration concessions. Steps have also been taken in recent years to encourage greater private sector involvement in the development of the mining sector. These include incentives for investment by both foreign and domestic companies, and support services intended to facilitate development of minerals.